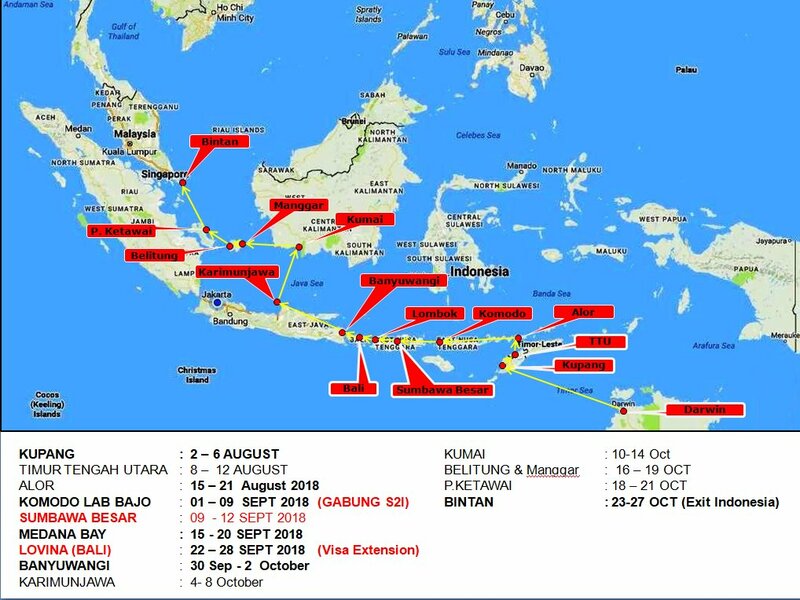 The first entry port will to be Kupang as in past years at 10° 09 and 123° 34' located 420 miles W.N.W. of Darwin and from there you will be able to follow our route across the country.Passage Route. Click Lavalon NTT Tourist Information Center for good information about Kupang and the surrounding islands. Most Important: Any navigational information mentioned on this page, our web site or any of our documents or publications are a guide only and should not be used as navigational information on their own. In recent years a number of yachts have run aground some sustaining serious damage and in one case a yacht was lost completely. The reason for this that on both electronic and paper charts positional errors have been discovered which can be more that half a mile, extreme caution is essential at all times. A complimentary BBQ dinner for participants will be at the Darwin Sailing Club in Fannie Bay on the evening of Saturday 21 July. This is an opportunity for you to meet the other participants in an informal setting before you leave Darwin. The Technical Briefing will be held on Tuesday July 24 at the Darwin Double Tree by Hilton Esplanade for Sail Indonesia and the following destinations in Singapore and Malaysia. This Briefing will provide formal instructions regarding the start procedures, radio schedules and your arrival in Indonesia as well as a range of other useful information. Presentations will also be given by representatives from Indonesia, Singapore and Malaysia and will be followed by a question and answer session. This briefing is compulsory, the skipper and one other member of the crew must attend. The Start from Darwin of Sail Indonesia will be in Darwin Harbour at 10:00am on Saturday July 28, 2019. Caution - Do not use the co-ordinates mentioned on this page for navigation - they are to be used as a guide only. Always take great care with any navigation information as it may not always be correct. The reason for this that in both electronic and paper charts, positional errors have been discovered which can be more that half a mile mile, extreme caution is essential at all times. This is the main port city in eastern Indonesia located at the western end of Timor and is known as the place where Captain Bligh finished his epic journey across the Pacific after the mutiny on the H.M.S. Bounty in June of 1789. After Inbound Customs, Immigration, Quarantine and Port clearance you can enjoy the Welcoming Ceremony by Local Government, and the Bupati in addition there will be a Gala Dinner, Cultural Festival and Exhibition with local tours, woven blankets, arts and crafts exhibits. Fuel and Water orders will be delivered to each yacht. Free time to go on a tour or make your way to Alor. The town of Kalabahi is the main town on Alor has been a popular stopover in past years, this year there will be an art and cultural Expo Opening ceremony at the city Sports stadium presented by all islands of the region. This event will have up to 1000 participants with traditional costume, dance and song. Outing to Alor Besar by bus. Always a cultural treat with beach party with swimming and snorkelling. Gala Dinner then sail to Lembata. The exact details for the stopovers between Alor and Sumbawa will noted on this page before the end of June. Bali as a world famous tourist destination really needs no introduction. Your arrival in Bali coincides with the time of the first extension of your Social Visa so if you need your Indonesian Social Visa extended this is the place to do it. Staff will be there to assist you with your Visa extension. The schedule of events for Bali is not final at this time but will include cultural shows and dances that Bali is world famous for as well as dinners and island tours. The International Airport is 20 minutes from Denpasar and there are many flights to all Indonesian and worldwide destinations every day. This stopover consist of 27 small islands, among them there are 4 larger islands which are inhabited. The larger island of Karimun Jawa is side by side with Kamojan Island, the anchorage is the old harbor is very secure with good anchoring. In Karimun Jawa you will find a peaceful climate, there is no transportation in the island, one small restaurant (Warung Ibu Esther) located close to the anchorage, the place is actually the gathering place for the sailors. For more luxurious surroundings there are three resorts about a 25 minute walk away. Arrive Karimun Jawa city anchorage for reception, cultural dance and shows. Visit Kura Kura resort with an optional dive tour. You can take the ferry to Jepara which is a wood carving centre or sail to our anchorage and dinghy dock. Here an official reception by will be staged by the local government. Then, you can join the tour of central Java with a steam locomotive train ride to the Losari coffee plantation for high tea then continue onto Borobudur, one of the 8 wonders of the old world then on to Ramadan Temple with overnight accommodation arranged at the hotel. Return by bus or continue on your own to visit Yoga. There will be an additional cost for this tour and is planned for 4 days and 3 nights and your vessel will well guarded in front of Harbor Master office in Karimun Jawa. The Kumai River is on the south coast of Kalimantan, here is the world famous facility where Orangutans that have been kept in captivity are reintroduced into the wild. Rally participants in past years have described their visit here as one of the highlights of their stay in Indonesia. Tours with Korindo should be arranged in advance and can be booked direct with them. To see details and great photographs of a previous trip up the Kumai river by the crew of Billabong in 2007 see the STORIES page of our website. Belitung is the name of the regency in Belitung Island, for the past three years Belitung has been the Sail Indonesia farewell destination. Regional Tour of Belitung , Traditional Ceremony, Traditional Festivities and lot of fun sharing in the cultural display and additional festivities are also planned. In Belitung you can complete your Indonesian visa and yacht exit formalities or if you wish you can sail on to Bintan or Batam and do it there. This is your exit point in the northern hemisphere where you will leave Indonesia for Singapore or Malaysia.